There are a plethora of tasty beef skillets that call for ground meat, and they are greatly appreciated when you want to cook up something fast and easy at the end of a busy day. However, there are meals that call for a certain level of sophistication, which requires elements that are more than plain and simple. It doesn’t take much to outdo ground meat, all you need to search for is the perfect cut of beef sirloin, then cube it at home to the bite sizes you like. 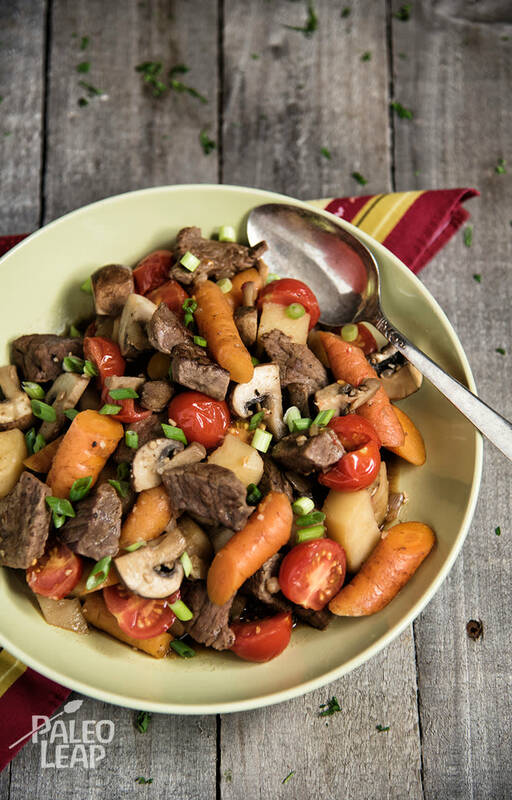 This beef and vegetable skillet is a classic, a little less elegant than beef sirloin with a fresh herb marinade, yet it is a meal that can be repeated day after day with uncomplicated substitutions. Potatoes, carrots and mushrooms are nice, though we encourage you to eat in season as it often means supporting local farms. In spring you may want to add some chopped asparagus or mustard greens to your beef skillet. In summer, radishes, beets, zucchini and peppers take center stage. And in fall, squashes, pumpkins, Brussels sprouts and cabbage enter the picture. Bottom line – use what you have, steak, stems and all. In less than an hour, you will have a copious and hearty dinner that can be enjoyed all at once, depending on mouths to feed at the table, or enough to set aside into individual portions for lunches later in the week. Melt some cooking fat in a large skillet over medium-high heat. Season the beef with salt and pepper all over. Brown the beef on each side, about 2 minutes; set aside. Add the carrots, garlic and potatoes to the skillet and cook until soft, 5 to 6 minutes. Pour in the beef stock, add the mushrooms and steak to the skillet, cover, and simmer 10 to 12 minutes. Add the grape tomatoes, and simmer another 5 minutes uncovered. Season to taste with salt and pepper; serve with green onions sprinkled on top.